The recently concluded premier international conference of human-computer interaction in Vancouver, BC called CHI 2011 showcased different innovations that focused on leveraging our diversity and connecting people, cultures, technologies, experiences, and ideas – one of which is ZeroTouch, a unique optical multi-touch sensing technology. Created by Texas A&M University’s Interface Ecology Lab, ZeroTouch is new type of optical muti-touch sensor that provides zero-force, zero-thickness, completely transparent multi-touch sensing. It has the ability to track more than 20 simultaneous touch points, the use of a stylus or other objects. ZeroTouch is a like an empty picture frame mounted with hundreds of modulated infrared sensors and several LED sensors similar to what television remote controls use. These sensors are activated one at a time during scanning sequence, creating a series of light beams that are interrupted by touches or objects inside the sensor. This means that whatever blocks or intersects the crisscross of light beams inside the frame would mean a touch. As such, it can also function even with the use of hands and gestures in open air scenarios. When compared to capacitive sensors of Apple's iPhone and iPad, interaction via ZeroTouch requires no pushing by the hand and fingers, therefore greatly reducing muscle fatigue. On the other hand, new forms of more precise, free air interaction are also enabled as compared to Microsoft's Kinect. To showcase the unique capabilities of this new natural user interface sensing modality, ZeroTouch was demoed using three applications namely intangibleCanvas, Hand + Pen in Hand Command, and ArtPiles. The intangibleCanvas application made use of ZeroTouch’s free-air interactive input modality, allowing users to reach through the sensor and paint on a projected screen. Being a multi-touch and stylus enabled real-time strategy game, the Hand + Pen in Hand Command application combined the use of pen and touch to show a completely new way of interacting with games. ArtPiles is a new curatorial tool for museums and art galleries. 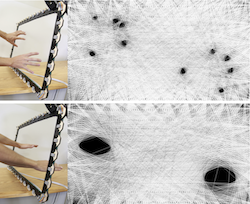 With the use of ZeroTouch’s combination of pen and multi-touch interaction, curators are able to do new visual and semantic manipulations of art collections. Whether used in supersized televisions, mounted on a desktop, overtop of a computer screen or hanged in the air, ZeroTouch magically turns any surface into a touchscreen. By pairing it with platform applications such as in iPhone, a presenter is able to change the thickness and color of the marker, as well as zoom in and out pictures by the usual dragging and pinching with the fingers. A human-sized ZeroTouch big enough for someone to walk through is already being thought of, which could possibly be able to detect movements in three-dimensional space. The technology used in ZeroTouch offers exciting new opportunities for multi-touch and gestural interfaces. This invention can be very useful for public exhibits and presentations where interaction from users is needed, as it provides good spatial resolution, fast response time, and zero-touch activation, with the use of either fingers or stylus. This article is my sixteenth contribution to Manila Bulletin -- one of Philippines' leading broadsheets -- published on May 23, 2011 (Monday) in the TechNews Section. You can view the PDF version here. Wow! I so want to turn my laptop into a touchscreen! :P This is a cool invention indeed. I wonder how much this would cost... LOL!